Mr. Zafar Naqvi is a management professional with vast experience of management both in the local and multinational environment. 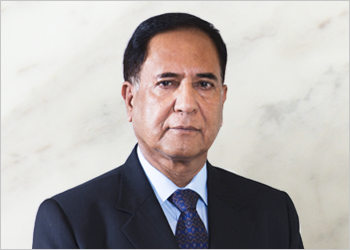 He joined the Corporate Sector in 1996 as a Director in AGP (Pvt) Ltd, a leading Pharmaceutical Company and in three years time he became the Chief Operating Officer of the company and held this position till his retirement in 2007. Thereafter, he served as Director and Advisor, in Merck (Pvt) Ltd, a German Pharmaceutical Company for 5 years, till 2012. Currently he is Director and Advisor in a Pharmaceutical Company of OBS group. Prior to joining corporate sector, Mr. Naqvi has also been conferred upon Presidential Award, Sitara-e-Imtiaz (Military). Mr. Naqvi holds an M.B.A. and M.Sc. degree in Strategic Management from Quaid-e-Azam University, Islamabad.